The ruins of the 16th century St Bridget's Convent, with their huge triangular gable, are a notable attraction in Tallinn, Estonia , but in the Summer they become transformed, forming the theatrical venue for the Birgitta Festival. From the 13 to 19 August 2016 this year the festival offers a programme of opera and ballet with Mozart's Cosi van tutte, and Tchaikovsky's Eugene Onegin, ballet to Prokofiev's Romeo and Juliet and to Bizet's Carmen as well as a theatrical piece Requiem ...and life before about Mozart. There are visiting companies from Minsk in Belarus, from Ekaterinburg in Russia, from Spain and from the UK, and both the Estonian National Symphony Orchestra and the Tallinn Chamber Orchestra are taking part. There is a chance to experience a different Russian operatic tradition when the Minsk-based National Opera and Ballet of Belarus, music director Alexander Anisimov, will be conducted by Andrey Galanov in a production of Tchaikovsky's Eugene Onegin, the production originally created by Valery Shishov and revived by Alexander Prokhorenko. Keeping to the Russian theme, the Ekaterinburg State Academic Opera and Ballet Theatre are presenting Prokofiev's Romeo and Juliet choreographed by Vyacheslav Samodurov and conducted by Alexey Bogorad. The UK-based Black Cat Opera Company present Mozart's Cosi van tutte directed by Keiko Sumida and conducted by Peter Ford with the Estonian National Symphony Orchestra in the pit. In complete contrast the Antonio Andrade Flamenco Company from Spain will be performing a flamenco-based dance work based on Bizet's Carmen. Requiem... and life before is the festival's own production, an innovative theatre piece directed by Belgian director Joel Lauwers which mixes actors from the Estonian Drama Theatre and from France, with the Latvian State Choir and Tallinn Chamber Orchestra conducted by the young Estonian conductor Mihhail Gerts and soloists from Germany and the Estonian National Opera. The work mixes words from Mozart's letters with music from the Requiem to create something innovative and new. 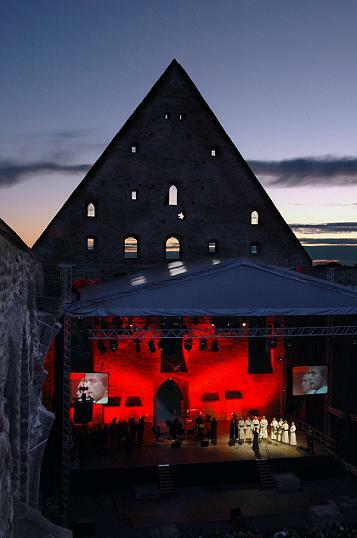 For the festival, there is a temporary roof over church ruins to provide a comfortable environment for audience and performers, and there is a restaurant. So all is set for a magical evening.